The incredible discovery was made in South Africa, around 150 km west of port Maputo. There, we find the remains of a huge metropolis that measures, according to tests, around 1500 square kilometers. This ancient city is, according to researchers, part of an even larger community with about 10,000 square kilometers and is believed to have been constructed 160,000 to 200,000 years before Christ. The region is somewhat remote and the “circles” have often been encountered by local farmers who assumed they were made by some indigenous people in the past. But, oddly, no one ever bothered to inquire about who could have made them or how old they were. 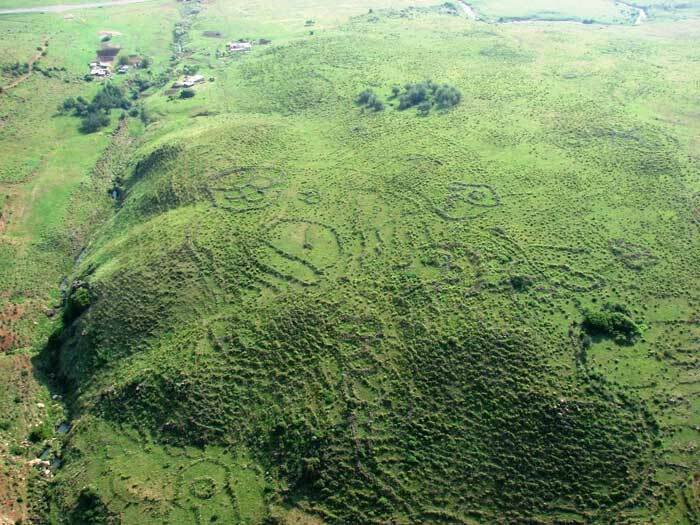 This changed when researcher and author, Michael Tellinger, in association with Johan Heine, a local fireman and pilot who had looked at these ruins for years, decided to investigate them. Heine had the unique opportunity to see these incredible structures from the air and knew that their significance was not appreciated. “I see myself as someone quite open-minded but I admit that it took me over a year to figure it out, and I realized that we are actually dealing with the oldest structures ever built by man on Earth. According to Telling: It shows that the Sumerians and even the Egyptians inherited all their knowledge from an earlier advanced civilization that lived at the southern tip of Africa more than 200,000 years ago… mining gold. These were also the people who carved the first Horus bird, the first Sphinx, built the first pyramids and built an exact stone calendar right in the heart of it all. Adam’s Calendar is the flagship among millions of circular stone ruins, ancient roads, agricultural terraces and thousands of ancient mines, left behind by a vanished civilization which they now call the FIRST PEOPLE. These were the ancestors of all humans today with an advanced knowledge of energy fields through planet Earth. They carved detailed images into the hardest rock, worshiped the sun, and are the first to carve an image of the Egyptian Ankh – key of life and universal knowledge, 200,000 years before the Egyptians came to light. Tellinger presents this groundbreaking new evidence in which is released in his latest book Temples Of The African Gods. It graphically exposes these discoveries and will undoubtedly be the catalyst for rewriting our ancient human history.